William Cowper who lived at Orchard Side (now the Museum) for several years in the late 18th century adopted three male leverets (baby hares) called Puss, Bess and Tiney and they helped him considerably to cope with his life-long battle with depression. He wrote about the hares extensively in verse and in prose, interesting even the illustrious philosopher of the time, John Stuart Mill, in their exploits. Puss once made an escape through the house window and ran off through the town. The hare was safely recovered having ended up at the lime works at the tannery near where Lime Street now stands. William built each hare a bed constructed in such a way that their droppings fell through a grate so they were always “perfectly sweet and clean” and they were allowed the run of the hall in the house and the garden. This meant guests often had to come through the back kitchen door as the front door of the hall opened directly on to Market Place. Puss became very docile, sitting upon William’s lap and nibbling the hair on his temples. When they were ill William nursed the hares back to health with a “variety of herbs”. All exhibited individual characteristics which fascinated him. William monitored the hares’ diet, ensuring they had what they needed including the fine white sand that he noted they ate which seemed to help their digestion. They particularly liked hawthorn and briar. Bess died young but Tiney lived to be 9 and Puss died at nearly twelve. So domesticated did Puss become that he ate bread out of William’s hand at the same time as Marquis, William’s spaniel. There are several objects relating to the hares on display at the Museum. 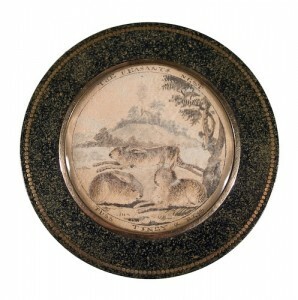 These include a fine circular snuff box depicting the hares drawn by George Romney, a renowned portrait painter of the time. You can also see a seal fob which would have been carried around on a waistband comprising three seals, each depicting and naming one of the hares. The fob is a a finely worked piece that once belonged to Cowper’s cousin, Lady Harriet Hesketh, and was gifted to her by Princess Elizabeth, the daughter of George III. It is fascinating to think that the hares were so widely celebrated, even known about in royal circles. You can also see the very detailed impressions that the seals made. Around the garden you will see several more contemporary hare sculptures, still frolicking where Puss, Bess and Tiney once played. Ferrety facts: The Easter Rabbit was originally the Easter Hare, being introduced into America in the 1700s by German settlers. “Mad as a March hare” and “hare brained” are also both historic expressions relating to the extreme behaviour that hares exhibit during their mating season (around March& April) when the males box each other and leap and frolic around the females!